If you think your life is great, you ain't seen nothing yet! This month's T3 cover feature showcases the tech that will make every aspect of your existence better – from commuting to cooking, shaving to sleep-tracking. Fancy making the perfect toast? Riding a bicycle created by a Formula One designer? Or perhaps using a toothbrush that gives you feedback on your scrubbing efforts? It's all here, ready and waiting for you to add it to your arsenal of neighbour-baiting cool gadgets. Elsewhere this issue, we take a look at the future of in-car entertainment, from driverless cars to heads-up displays. Our Complete Guide To… gives you the full lowdown on smartwatches, giving you all the information you need to select the perfect wearable for you. We challenge a brave journalist to commute from London to our offices in Bath using only electric vehicles – the results are both enlightening and hilarious. The three best 4K action cameras face off to see which is the most adept at shooting your extreme sports capers. And our Agenda section lines up another seven exciting adventures with tech that you can start today, from a James Bond spy experience to a driving day at the Porsche track at Silverstone. Add to all of this hot-off-the-press bulletins about the latest gadget releases, and our ultimate buyer's guide to help you invest wisely in new kit, and you have the only tech magazine you'll ever need. Life really is better with T3. Subscribe to T3 from only £13.99! 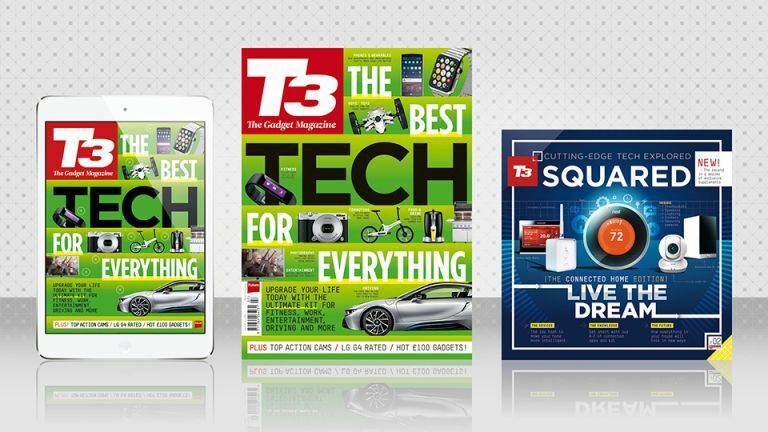 Get the complete print + digital package and gain instant access on your iPad, iPhone, and Android device, plus get the print edition delivered to your door with your FREE 20 page supplement, T3 Squared* - all for one single price. * For as long as T3 Squared is published.